Formed by the remaining members of FIFTY FOOT WOMAN when their singer quit the band back in 2010, with one EP, two full-lengths and a single already in their catalogue, the Polish Doom/Stoner instrumentalists MAJOR KONG present us with a limited edition vinyl reissue of their debut “Doom for the Black Sun” courtesy of Transubstance Records. If you know MAJOR KONG, well there's point in me trying to elaborate. But still, there are people unaware of what to expect. Side one and cue "Witches On My Land". Some guitar feedback backed with a woman chanting hystericaly about the sign of the Devil and a massive, slow paced mammoth of a riff hits you, with the required schorching solos to boot. SLEEP meets SABBATH in this tune, or simply put, MAJOR KONG. Next up is "The Swamp Altar", a zesty fusion of Blues and Metal at its best. 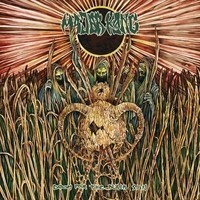 Even the title is a sure giveaway for the oozing swamp metal you should expect. "Acid Transmission" completes the circle in style. Once again an audio sample about LSD and dope, with a trippy hugely overdriven journey through psychedelic Doomy Stoner territory. Side one done, off to side two. And what a start. I think you half expected it. Opening with a morbid dialogue about a stolen body and graverobbing death cults, and “IDDQD” is here to crush you once again. A slow paced 9 minute epic behemoth of a song, with the mandatory ultra-heavy riffs and wailing solos. Great vibe and heaviness at once. Just as Doom should be. Time to end the journey with a trip through "Primordial Gas Clouds”. A massively heavy and groovy 11-minute jam (check out that bass line impro built-up dude) which breaks down (or should I say melts down?) to fuzz-ladden psychedelic soloing. Excellent! The guys chose to leave out “Demolition Whale” from the reissue. A great song by itself, yet, I feel like doing so was a good thing after all. The shifted track list works better like it is, giving more sense and flow to the music. The trio are great at what they do, plus the absence of vocals serves in creating a great cinematic feeling that would be impossible otherwise. If you're into fuzzy oozing Doomliness, MAJOR KONG and “Doom for the Black Sun” is a no miss choice. Oh, and do yourself a favor. If you like this, by all means, do check their back catalogue.